We are passionate about the work we do and are dedicated to making a positive contribution to our community & planet. Energy Design is a company at the crest of a new wave of American businesses taking to heart the old values of hard work, pride in workmanship, and building things to last. At the same time we are searching for ways to reduce our impact on our planet and find new technologies that may help solve some of our world’s problems. As a training agent, Energy Design has helped support over 20 photovoltaic professionals and electricians get hands-on experience in the field since 2004. Vince McClellan has spent his life learning and perfecting his skills as a solar electric designer and installer. 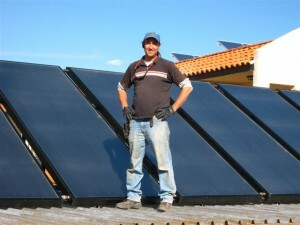 He is one of a small group of people that helped to raise the bar on quality solar design and construction. With 35 years of experience specifically in photovoltaics, Vince McClellan is one of the most knowledgeable individuals in solar electric design and construction in the Northwest. He started his training in electrical and began installing systems in 1982 in the Hawaiian Islands. Since then, he has installed over 300 solar electric systems in the Hawaiian Islands, California, and Oregon. 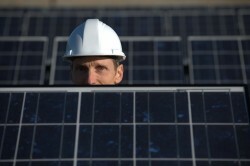 As an employer and instructor, he has trained hundreds of solar professionals. For four years he was an instructor at Lane Community College in the Renewable Energy Associate of Applied Science Program, and has taught numerous workshops and classes throughout his career. Jerry performs all duties of running a small renewable energy business, including system design, sales and marketing. A second generation “solar guy” with over 25 years of experience in the industry, Jerry and his family returned to the Northwest in 2013 after 15 years in Tucson, Arizona. He joined our team in March of 2014. Jerry is a NABCEP certified Solar PV installation professional as well as an Oregon LRT. In his spare time he is an avid homebrewer, gourmet solar cook, and enjoys being in the outdoors with his wife and two sons. Jeremiah has been a partner at Energy Design for over a decade. He is a graduate of the Renewable Energy Technician program at LCC. Jeremiah has been working in the construction industry since 1995. He as a passion for electrical design projects utilizing renewable resources, agricultural facilities & mid-sized commercial photovoltaic project implementation. Jeremiah is an entry level NABCEP professional. Deb has a background in engineering, architecture and alternative energy with a Bachelor’s degree in Mathematics and Computer Science. Before coming to work in the Solar PV/electrical contracting field in 2011, she spent 20 years as a software developer and data analyst in a variety of industries including research, government, telecommunications, airline management and hospitality. She is the mother of 2 and grandmother of 7. She is a daily biker of the Eugene Riverbank trail system and a bike commuter. She also enjoys riding around Eugene on a tandem with her husband. Brady is a native Oregonian who became interested in Solar while attending Lane Community College in 2010. After graduating with a degree in Renewable Energy specializing in Photovoltaics in 2013 he moved to Austin, TX and began working in the field. He quickly became a Lead Installer and has installed 300+ arrays over the past 6 years. He has been able to acquire several licenses in this time, the most recent being a Limited Renewable Energy Technician in Oregon in addition to his Residential Wireman license in Texas. Brady moved back home to Eugene in 2019 and has made a solid addition to the crew. He recently celebrated installing his first MW of Solar Power and we look forward to celebrating many more with him! “I’m deeply passionate about driving solar technology forward and studying financial markets.” Matthew is our in house CAD & Solidworks wizard. In addition to permitting and design support, Matthew is our go to for data system architecture.